The last instruction of Step 4: “With the right sides facing, pin the top and bottom sections together and stitch.” First time through, Kathy sewed the gathered edge to the upper edge ‘right sides together’ which did not work. Assemble with both sides facing up, overlap top edge over bottom edge, and sew in place. The waist ties will cover everything. Pink Chalk team member Jacqui taught Kathy to use the 1/4″ presser foot with a flange for perfect garment topstitching. We LOVE this use of a traditional quilting foot! The bust darts were a bit narrow for Kathy’s size 12 frame. 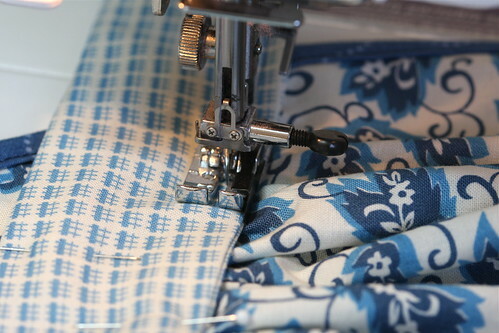 A quick pattern fitting should be used when making larger sizes. 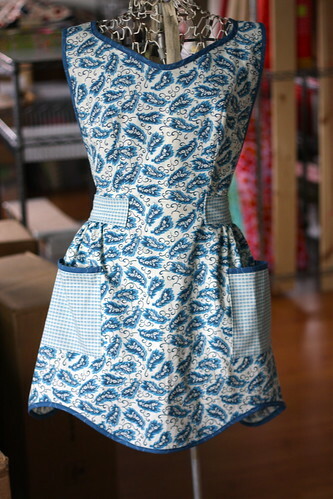 Self-made waist ties were substituted for ribbon. This requires an additional 3/8 yard of fabric. Cut four 3″ wide, selvage to selvage strips. 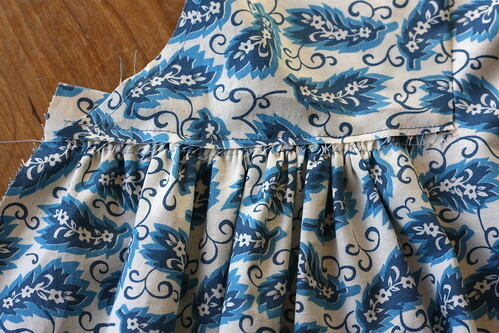 Sew right sides together with a 1/2″ seam allowance for 2″ finished waist ties. 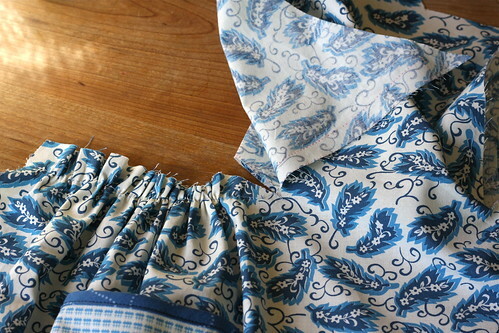 Cut length after sewing ties to apron and doing a fitting. The pattern was straightforward and easy for a beginner. Alicia used a solid fabric for the pockets – Moda Fabrics Bella Solids in Ochre. Fabric was pre-washed which resulted in some shrinkage. Finished placemats ended up a little shorter than the pattern dimensions (10.25″ rather than 11″). The small size works well for a small dinner plate or salad plate; a big dinner plate looked oversized. 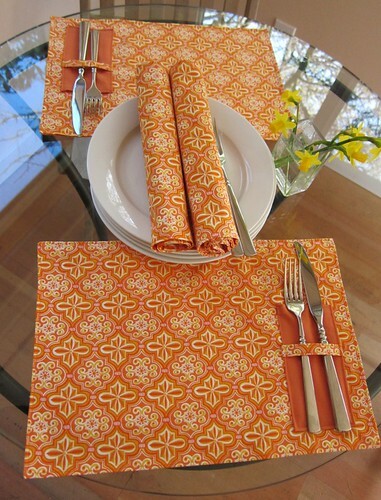 The smaller scale placemats fit nicely on a small cafe table (Alicia’s regular size placemats look too big).